On June 13 and 14, Chicago-based guidebook author and travel journalist Kate Silver ventured through the seven counties of Northern Indiana to choose a winner of the Northern Indiana Pizza Wars. She selected Iechyd Da Brewery in Elkhart as the winner and awarded honorable mention to The Café at The Bowling Alley in Warsaw. (To read more about the winners, see this press release.) Here’s the story of her journey. The task was serious: Judge the Pizza Wars competition in Northern Indiana and select a winner for the Critic’s Choice award. The competition is the brainchild of the Northern Indiana Tourism Development Commission, and the goal is to drive tourism to each of the seven counties it represents. At the end, NITDC will create a Pizza Trail, guiding visitors to taste each county champion. This is the second “food war” NITDC has dreamed up, and if the success of last year’s Burger Wars is foreshadowing, the impact will be enormous for each of the pizza joints I’m to visit. The county burger champions from 2014 reported dramatic upticks in sales. In the Hoosier state, food is serious business. Over the course of two days, June 13 and 14, I traveled around Indiana, leaving a trail of pizza crumbs and dribbles of sauce in Howe, Middlebury, Warsaw, Bremen, Elkhart, Granger, Michigan City and Chesterton, scoring pizzas on their crust, sauce, cheese, toppings, history/ambiance and execution. At each location, owners were encouraged to serve the pizza that best represents their business. At some places that meant one pizza. At other places, it meant six. All of which were remarkably different. Along the way, I learned this: Indiana knows its pizza, and each of the pizzeria owners has his and her own intriguing story. Choosing a “winner” wasn’t going to be easy. Here’s what I discovered during my pie pilgrimage. Living in Howe, Indiana, surrounded by Amish country, TJ Iannarelli knew that opening an Italian restaurant was a gamble. But that’s exactly what he did 12 years ago, wooing even his meat-and-potatoes loving neighbors with his authentic Italian recipes—including pizza—adapted from his Italian grandmother. Iannarelli invited me back into the kitchen to watch him hand-stretch his crust, which he covered in garlic and olive oil and then topped with onions, green peppers, tomatoes and cheese. It came off the conveyor belt oven in minutes, and the chewy-crisp crust, “really a bread,” explains Iannarelli, is as good as it gets. The restaurant, which sits in a cozy house built in 1845, has become a popular gathering spot for its food and regular live entertainment for the town of about 250. In fact, the neighbors surrounding the restaurant have made a habit of contributing to the fresh ingredients on the menu, leaving basil, tomatoes, chili peppers and even pears outside the back door. “You never know what you’re going to find,” Iannarelli says. That devotion goes beyond the county line. Iannarelli says the restaurant has developed such a loyal following that customers drive in from as far away as Fort Wayne—nearly 65 miles away—eat pizza (or the restaurant’s signature lasagna) and then turn around and head home. While he’s thought about expanding the business, he ultimately decided he likes it as it is—an extension of his family. “We kind of like being small here,” he smiles. The front wall at Rulli’s is crowded with team photos dating back 28 years, when the family opened their first carryout joint. Owners Sam and Mary Rulli’s kids grew up here, and now their grandkids weave through the black-and-white checkered tables, gleefully, in front of the Italy-inspired murals and bricks painted carefully on the walls. Sam got his start in the restaurant business 33 years ago, when he worked at his family’s restaurant, Pasquale Rulli’s, in Mishawaka, Indiana. His recipes have been passed down from his Italian grandparents, and you can see his grandmother’s photo on the wall, stirring sauce. Sam says his grandfather taught him to make crust nearly 40 years ago. One thing is clear at Rulli’s: they’re not afraid to get experimental with their top-notch toppings—nor are they afraid to attempt to stuff a judge! They loaded the table with five pizzas for me to try: a Margherita pizza (tomato, fresh basil and mozzarella), Nana’s Sweet pizza (Vidalia onion sauce, chicken, onion and tomato), Di Gala Interno Boca, which, the Rullis tell me, translates to “party in your mouth” (diced green peppers, mushrooms, onions, pepper rings, pineapple, tomatoes, olives), Papa’s Spicy Pizza (giardinara, tomato, pepperoni and onion and hot sauce) and Spaghetti Pie (a deep dish topped with spaghetti, meatballs, marinara and mozzarella—sounds odd, but it totally works). Even with all of those competing flavors, that pie that rang supreme in the bunch was the simplest: the Margherita truly demonstrated the brightness of the sauce, the quality of the cheese, the freshness of the basil and the balance of all the ingredients melding together. I started out limiting myself to just one bite of each of the pizzas, but in the end, threw caution to the wind and ate a full piece of the Margherita. It’s true, I did a double take on this one. 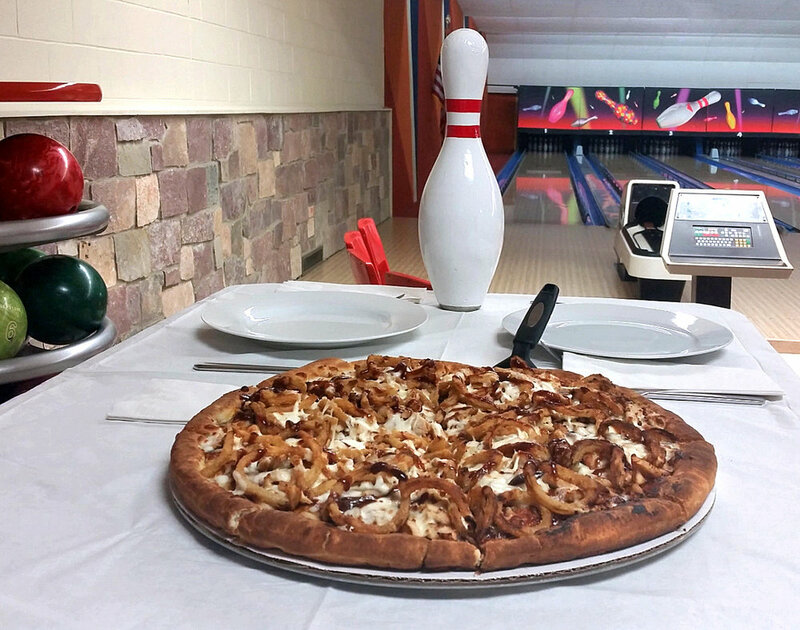 A bowling alley makes the best pizza in the county? In a town with more than a dozen pizza joints? And a population of 14,000? Turns out, Bryan Bibler knows pizza—and bowling alleys, for that matter. Bibler tells me that he worked at the bowling alley as a kid, and recently returned as the food and beverage manager, with the goal of ramping up the pizza program. He brings to the lanes 25 years of poultry perfection—he runs his own barbecue catering business—and boy, can you taste that expertise in his Bib’s Smoked BBQ Chicken Pizza. Served on a thick, focaccia-like crust, slathered in his secret BBQ sauce, piled high with cheese and tender smoked diced chicken and then topped with onion tanglers, it should come as no surprise that this 16-inch pie looks a total gut buster. But somewhere, somehow, the flavors—onion tanglers and all—come across as more of a symphony. Not usually a lover of BBQ pizza, this one had me at the first bite. Three pizzerias in, I couldn’t stop myself from finishing my entire enormous piece. The same could be said for the pizza. Sitting in the front booth as I walk in, a man, who is waiting to pick up a pizza, says that the phone has been ringing non-stop with to-go orders since he showed up a few minutes ago, right as the joint opened. As I settle into a seat, people come and go, picking up their pizzas, which fill the space with a kind of Italian ambrosia. The Wooden Peel, it turns out, is an institution in Bremen. It opened in 1975, and owner Kathy Beutel-Galloway’s parents bought it in 1982. She practically grew up here, and bought it from her parents in 1998. She says the specialty of the pizzeria is sausage, which they blend and cook themselves (they tried changing it once and customers caused an uproar). Today, her daughter and granddaughter work here, alongside her. The barbecue chicken pizza I try, with barbecue sauce, grilled chicken, green onion, cheddar and mozzarella, is picture perfect. Thin and crispy, it’s cooked to perfection with just the generous amounts of cheese and a barbecue sauce that cuts through the other flavors with a Western-style “howdy.” A true contender, I can understand the buzz about this place. Also notable: the cheeky décor. As I head towards the door—and towards the fifth tasting of the day—I take a photo of the pizza-eating cartoon pig on the wall. I post it on Facebook with the words, “self portrait.” Then I soldier on, headed toward the next battleground of the Pizza Wars. The laid-back Iechyd Da Brewing—pronounced “Yacky Dah”—turns out to be the ideal finishing spot for the day. There, owner Summer Lewis tells me that when she and her husband, Chip, opened the brewery three years ago, they expected beer to be the draw and the food an added perk. Today, she says they’re finding both food and beer have a near equal appeal. With an emphasis on using local ingredients, mixed with an adventurous palate and flavor combinations (like their tomatillo and chorizo pizza), the brewpub has drawn a devoted following. I become one of that devoted following as I bite into The Kidwelly, a pizza inspired by an appetizer Summer had when traveling in Wales with her husband, before opening the pizzeria (his Welsh heritage dates back to 1635, and the photos they took on the trip line the walls of the brewpub. Many of the beers they brew are also inspired by Britain). 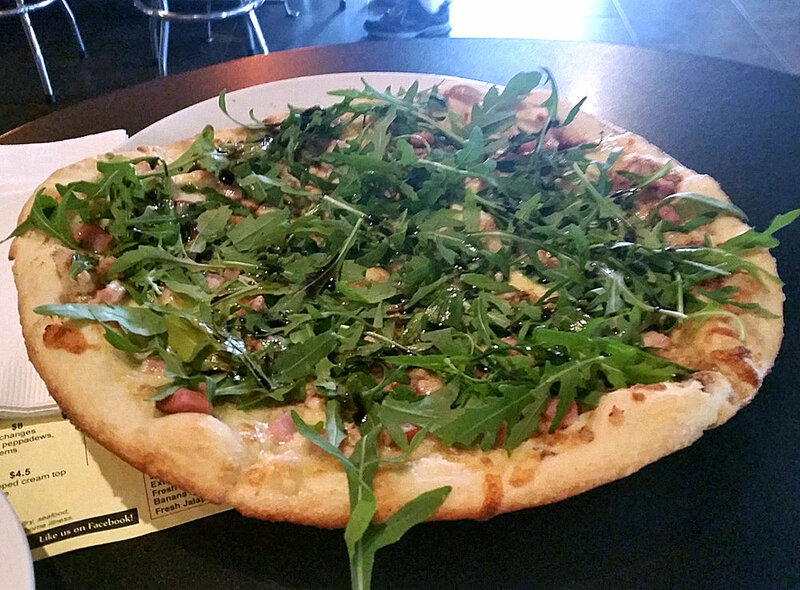 The crust, so light it defies gravity, is topped with rosemary oil, ham, smoked Gouda, mozzarella, arugula and balsamic. The sultry smell of smoke and tart vinegar tease my nose as I lift the first piece to my mouth. The local peppery greens punctuate the salty meat and light sprinkling of cheese. The pizza is, in fact, so light it almost feels quenching. Even though it’s the fifth and final tasting of the day. Summer tells me that she was a little intimidated to put pizza on the menu of a brewpub in Elkhart, considering the heavy Italian influences of the town. By the time I leave the place, which is on its way towards being packed at around 6 on a Saturday night, it’s clear that she and Chip made the right decision. To drive by Giannetto’s, you might not give it much thought—it shares a building with a gas station off State Road 331, after all. But as soon as you walk in the door and take in the roomy, well-appointed restaurant filled old photos, natural light and folksy red-and-white checkered tablecloths, you forget the petrol proximity. Victor Giannetto explains that the restaurant serves the type of made-with-love food that he’d serve guests in his own home. Interestingly, Giannetto is the only Italian among the Pizza Wars finalists who doesn’t rely on recipes dating back generations. Rather, he approached pizza from an entrepreneurial perspective. In 1978, he tasted stuffed pizza for the first time at a place called Nancy’s in the Chicago area. “I loved it. I couldn’t get over it,” he says. And he set to work, creating his own recipe and, along with the help of his family, building his business around it. As we’re talking, the thick-as-a-casserole Chicago-style stuffed pie is delivered, smothered in red sauce. I dig in, stretching cheese like loose rubber bands, and declare, within a few bites, that this pie could give Chicago deep-dish joints a run for their money. In fact, since winning the Pizza Wars for his county, Giannetto says he’s been slammed with business. On the weekend I was there, he said had to stop all carryout orders because he was running out of ingredients. The first Albano’s opened in the house of Jim Albano’s grandmother, Rosalie, in 1957. Without her consent, I might add. She was away visiting family when Jim’s father, also named Jim, and brother, Russell, decided to sell their ’54 Buick as collateral for a loan to start up a pizzeria—in their mother’s house. Today, Albano’s Villa—which has since moved to a different location—is an institution with three locations and a rich history. Albano tells me that the one of the busiest nights, ever, for the pizzeria was in 1969, when NASA first landed on the moon. That night, people in Michigan City were sitting at home, glued to their TV, eating Albano’s Villa pizza. That very recipe has been passed down and is still served today. “The customers don’t want changes,” says Albano. So he continues creating the same spice blends that his father and uncle did before him, making everything from scratch, even grinding the meat for the sausage, which he also spices, himself. He serves me that sausage on two different pies: one plain sausage, the other “Albano’s Masterpiece,” with sausage, pepperoni, mushroom, onion, bell pepper, black olive and tomato. The thin crust is cut in squares like the tavern-style pizza popular in Chicago, and the sauce, which is made with a secret blend of spices, strikes a careful balance with the rich sausage and oodles of cheese. The dark, grotto-like restaurant is filled with nostalgia, as families bring the next generation in to share the pizza they grew up on. Judging from the pizza I had here, there’s no question that Rosalie would be proud—even if hosting a restaurant in her home wasn’t exactly her dream. Today, Duneland Pizza has been open for 43 years and employs Craig’s daughter and granddaughter. The restaurant feels a bit like an art gallery, with the owners’ stunning photos of the dunes lining the walls, and driftwood from area beaches serving as a reminder of time and place. While sharing his history, Berg serves up a number of different pizzas, showcasing the many different crusts he creates—hand-rolled, thin, whole wheat, cornmeal and deep dish. The variety is impressive, but two are standouts: the hand-rolled crust, with its light, pliant feel and punchy yeasty flavor and the characteristically crisp cracker-like thin crust. All are topped with a slightly sweet sauce and an array of fresh toppings. While the pizza here is stellar, so is the character of the owner. Berg tells me a story that demonstrates the power of community, even among competitors: a few weeks ago, when the votes were rolling in for the county’s best, he and his long-time friend, Jim Chaddock, the co-owner of the Rolling Stonebaker (which was the other leading Pizza Wars contender in Porter County) decided to kick the competition up a notch. They set up shop in Duneland’s parking lot, offering free samples and encouraging people to make donations to Dunes Learning Center, a non-profit that immerses kids in nature in the area. In just two hours they raised $1,300, using the power of Pizza Wars for the greater good. Pizza has long brought families together. It’s heartening to see it do the same for a community—and that doesn’t just apply to Chesterton. On my journey to each of the seven counties, I was impressed not just by the pizza prowess, but by the enthusiasm, pride and devotion that came from every single county. It was so thick you could practically taste it. And that, to me, is the true prize of the Pizza Wars. Kate Silver is the author of 2015 Frommer’s EasyGuide to Chicago. A freelance journalist, her work appears regularly in Washington Post, Chicago Tribune, Midwest Living and other publications.